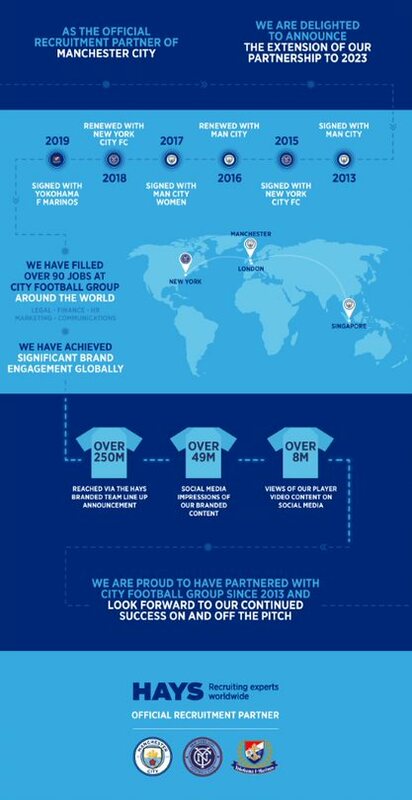 Hays, the world’s leading recruiting experts in qualified, professional and skilled people, has announced the renewal of its global partnership with Manchester City Football Club. As part of the deal, Hays will work together with City to curate new and exciting digital and social content over the next four years, continuing to integrate and fully utilise the partnerships to reach audiences all over the world. The renewal will be further boosted by the new naming rights which make Hays an Official Tour Sponsor for the Club’s overseas tours and provide further access to exciting experiences for Hays’ staff across the globe.